The Regiment of Artillery is an operational arm of the Indian Army. At present, it is the second largest arm of the Indian Army, and with its guns, mortars, rocket launchers, unmanned aerial vehicles, surveillance systems, missiles and other artillery firepower, it makes up almost one-sixth of the total strength of the Indian Army. But still many people are not aware of its contributions to the country. In this article we will have a brief look on its history and its importance. It was officially raised on 28 September 1827 as the Bombay Artillery as a part of the Royal Indian Artillery of the British Indian Army. 28 September is now celebrated as Gunner's Day in the Indian Army. It's headquarters are in Nashik, Maharashtra. The School of Artillery of the Indian Army is situated at Devlali near Nashik, and the Regiment of Artillery Museum, established in 1970, is also situated in Nashik at Nasik Road Camp. It has produced 5 Chiefs of the Army Staff which is the most by any regiment. Mughal Emperor Babur is popularly credited with introduction of Artillery in India, in the Battle of Panipat in 1526. But evidence of earlier use of gun by Bahmani Kings in the 'Battle of Adoni' in 1368 and King Mohammed Shah of Gujarat in fifteenth century have also been recorded. A few Indian mountain artillery batteries, officered by the British, were raised in the 19th century and were a part of the Royal Artillery. The Royal Indian Artillery (RIA) of the British India Army, was raised on 28 September 1827, as a part of the Bombay Army, a presidency army of the Bombay Presidency. It was later renamed as 5 Bombay Mountain Battery, and participated in the First Anglo-Afghan War (1839–1842). Many of the Indian personnel of the Bengal Artillery were involved in the Revolt of 1857 so the three battalions of foot artillery then in existence were all disbanded in 1862. All Indian artillery units were disbanded except for four mountain artillery batteries of the Bombay Army and four field batteries of the Hyderabad Contingent. . In the 20th century, the Artillery was later involved in the First World War, in East Africa, Gallipoli, Mesopotamia, and Palestine. The modern Regiment of Artillery was raised on 15 January 1935, when the first three Indian Field Regiments, originally numbered A, B, and C were authorised. Originally it was called the 'Indian Regiment of Artillery', which later became 'The Regiment of Indian Artillery' on 1 November 1940 and 'Royal Regiment of Indian Artillery' in October 1945, after its success in World War II and then finally The Regiment of Artillery after independence. After the partition of India in 1947 it was divided between the newly formed artillery regiments of India and Pakistan. In the coming years the artillery took part in all the operations fought by the Indian Army, the latest being the Kargil War. The Regiment of Artillery was divided in the mid-1990s between the Field Artillery, the Corps of Air Defence Artillery formed in January 1994, and the Army Aviation Corps formed in November 1993. The Field Artillery is the largest successor branch, with 190 regiments. On 15 January 1985, a commemorative stamp depicting a Gunner and Howitzer from Mountain Battery was released by India Post, on the Golden Jubilee of the Regiment of Artillery. 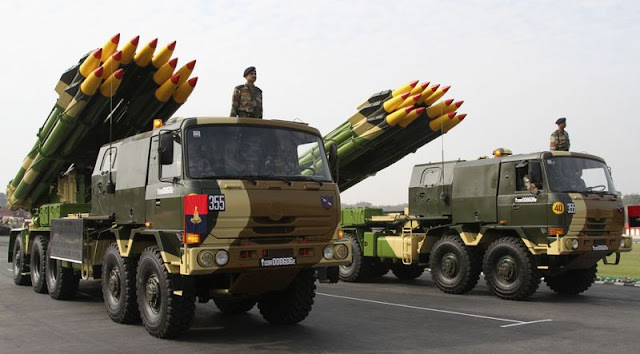 During the Kargil War, it was the Indian Artillery that inflicted the most amount of damage.